The report below covers where we have come, where things now stand, and our way forward. As you will see on page 2, our programs are being reopened in this coming week. It will take a while to get settled in our new quarters; but we are confident about the future. We greatly appreciate the support and encouragement that we have received from a great number of individuals, churches and organizations. Please pass this statement on to others who may be interested. And please let your church or other organizations know that we are in need of their continued support. Also, please contact Rev. Bernice Warren if you have any questions or to invite us to meet with your Outreach Committee or other groups (RevBerniceWarren@chestereastside.org). We need your continued support. As God spoke through the prophet Isaiah (Isaiah 43:19) and promised to “do a new thing” in the life of the children of Israel during difficult times in their history, God has also spoken to Chester Eastside Ministries in the midst of dwindling resources and an aging building. The Board of Chester Eastside Ministries with assist from others is developing a Strategic Plan which will lead us into the future. New Things can happen in new ways through the power of The Spirit and we ask you to join us as we remain open to work in new ways. many-year history of providing essential services to the people of Chester, as it becomes an independent organization. This report is an update on where we have come, where we stand, and the way forward. needed function in Chester, in order to realize its Christian mission. Its provision of emergency food and clothing to those in want, education and cultural enrichment to help young and old realize their full potential, its nurture of the spirit, and its forthright advocacy for social justice are well known and valued in Chester and far beyond its borders. By enabling people throughout Delaware and Chester Counties to serve others through their volunteer efforts, we have enriched the giver as well as those given to. Presbytery of Philadelphia, including the former church building out of which we have operated. In recent years, this support has declined significantly, at a time when the Presbytery was facing major economic challenges of its own. question: Is it doing any good? We know from countless comments from the people whose lives we have touched that yes, a great deal of good. Young people have gotten their start in our afterschool program and gone on to college and, in one case, doctoral study. And we continue to seek more systematic evidence of the effects of our work. the program. Behavior problems became less, and self-esteem, work habits, and positive social behavior improved. The positive trends steadily improved, the longer youth were in the program. School grades also improved over the course of the program with no one having less than a “B” by the end of the year. increased educational activity at home, and constructive engagement with teachers. Children showed gains in vocabulary, reading and math skills, and discipline. These gains were still evident months after the end of the program. programs and base operations, the remainder being provided by the Presbytery. The condition of the aging building, which is owned by the Presbytery, has been an object of growing concern. Ministries of the Delaware Valley (PCMDV), the body created by the Philadelphia Presbytery in 2007 to oversee its urban mission programs, agreed to terminate their current relationship. 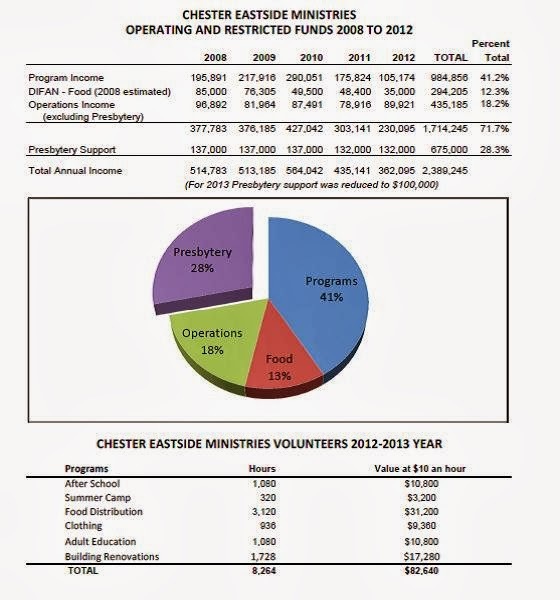 In order to assist us in making a smooth transition to our new status, PCMDV has agreed to allow Chester Eastside Ministries to continue to use its tax-exempt status under 501(c)(3) and its registration with the Pennsylvania Bureau of Charitable Organizations, until such time as Chester Eastside Ministries is able to acquire these on its own. In mid-September, Chester Eastside Ministries faced a different challenge: The building it has occupied for many years has been found to have major structural problems, moving the Trustees of the Presbytery to close it to further use pending an assessment of the potential for salvaging parts of the property. This forced us to seek other locations to carry on our programs in the interim. Aside from the disruption of the ongoing emergency food and clothing programs that serve hundreds, this new crisis came just as our after-school and adult education programs and Parents First, the workshop series for parents of children in the early grades, were about to begin. organizations, we have found “foster homes” for all our major programs, and they will all soon be up and running. The Food and Clothing Ministries and the After-School Program will be operating out of St. Paul’s Episcopal Church, located a short distance away on East 9th Street. We will also have the use of office space there. Parents First will be at the Boys and Girls Club of Chester. The Adult Ed/GED Program is up and running at the Chester Student Center, at West 9th and Kerlin Streets. engaged in long-term strategic planning so that it can continue to pursue its mission and develop its potential in new ways. This work has been aided by Jim Leming, a private consultant. expresses what we do, what we don’t do, and what is distinctive about CEM. o Organizing our resources for maximum effectiveness. o Delegation of responsibilities and accountability. o Creation and documentation of standard procedures. o Obtaining and organizing data regarding our programs and their impact on target populations. o Managing our volunteer resources. o Networking with stakeholders and potential partners. o Formulating our message and spreading it through means ranging from direct contacts to mass media. o Researching potential future sites, including the possibility of using structurally sound parts of the present building. into a new phase of our long history as an essential resource to the people of Chester. to an average of 200 adults and children per month. It is one of the largest such operations in Delaware County. Beyond providing bags of groceries, including fresh produce, the Food Ministry is a welcoming place, offering a cup of coffee, a hot meal, and a word of support to people, many of whom feel abandoned and alone. human touch is in many ways as important as the tangible service. It is often through the Food and Clothing Ministries that people learn about other programs at Chester Eastside Ministries, programs that not only accept people whatever their circumstances but help them fulfill their true potential. children aged 6 to12. To the children, many of the activities may seem to be just a fun time with their peers. In reality, they are developing the kinds of qualities, such as a “can do” attitude, leadership and cooperation, persistence on task, and resilience, that can make the difference between success and failure in school and beyond. Typically, ten adults attend each session of our adult literacy and GED program. The GED (General Education Development) tests allow a person who has dropped out of school to earn a high school diploma or its equivalent. A number of people who have earned their GED have gone on to attend post-graduate programs. There are some who are still working on basic reading and math skills. One of the features of the Chester Eastside Ministries Adult Ed program is a one-page summary of the day’s news. It is useful in giving students an opportunity to link what they are learning in class with breaking news, sports, and weather that they pick up on TV and radio. The news summary is shared with other programs and teachers who request it. This ten-week workshop series helps 20 to 25 parents of children in grades prekindergarten through three to support their children’s success in school. It has been shown to bring about changes in parenting practices and involvement in the children’s education, as well as, students’ progress in school. and crafts, swimming, and special trips. In particular, it means a widening of horizons beyond the child’s immediate world.